Thank you so much for the lead on this. I really appreciate that you took the time to pass this on to me. I could not have done this without your help. Not sure it was me that passed it on to you! I did pass it on to a few people, just don't remember who. You are right. It was kavesman1 that did so my apologies to him for my a$$-umption and not checking the PM before I posted. Apparently this must have changed hands several times, it does not alter the fact that you may have participated as well. Which electrical fittings do you need, id like to get a couple just incase. Last edited by bosko; 01-05-2019 at 21:23. My Ebay history shows '2 Pin Molex Connector Lot, 5 Matched Sets, w/14-20 AWG .093" Pins, Free Hanging'. These are the connectors only - attach them to the wires on the fuel pump. You'll need to check your generator's connector to confirm which one (M or F) to put on your fuel pump. The E1074 is a direct drop in with the proper connector already installed. Last edited by Zed254; 01-06-2019 at 01:14. Does anyone know if this Airtex pump can be used in the 831A. I have the Airtex pump in my 803A and a Facet pump that has no visible identifier in my 831A. It would be great to stock a spare that fits both. The 831A pump has a flexible line on one end so it shouldn't be hard to retrofit. 98-19749 is the Facet part number. What has Facet told you about a replacment pump? Someone I know in the Biz, told me no, the 803A pumps will not, or better said, should not work in a 831A. But then again, he said he had never heard of anyone trying. That's because there is not much info to find. One thing I did find. I went to an older parts manual. The Part number, 98-19749, (Facet part number) was different. It was: 98-19749-01. I looked it up, and found nothing. perhapy asking Facet about this number, might bring more info? Last edited by Guyfang; 01-06-2019 at 15:37. Actually the Fact pump is marked. It's just in a lousy spot. It's stamped on the mounting flange of the pump. Bolts holding the pump in place obscure most of the part number. Here is a shot of my 831's Facet primary pump with the top mounting bolt removed. You can see it's PN 40193. Last edited by kloppk; 01-06-2019 at 15:46. 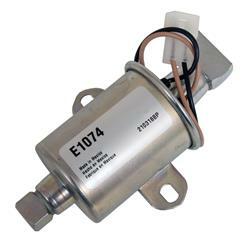 MEP-831A Governor Controller Replacements for the SLC100, 2990-01-477-1371, 98-19539. Sharp eye!! I found it in the Facet catalog, under CUBE.